Whether you're looking to brighten up someone's day or add a splash of colour to your living room, you'll find the perfect flower arrangement at Baroness Floral Design in Woodbridge. Our centrepieces and bouquets range from classical to whimsical, and our attentive florists are ready to create the personalized arrangement of your choice. From elegant centrepieces to romantic bouquets, our wedding arrangements will help you create the décor, ambiance and look for your special day. At Baroness Floral Design, we've been working with wedding planners and future brides for years, and we understand that when it comes to the Big Day, every detail counts. 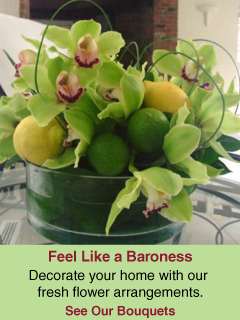 At Baroness Floral Design, we love a strong vision! 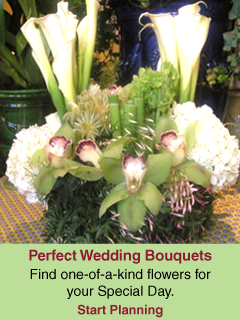 Talk to us about your event, and we'll provide the flowers that will seamlessly complement the décor you imagined. 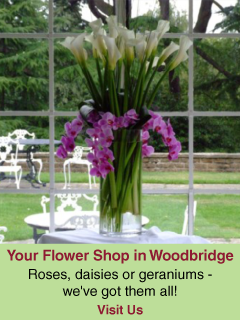 Schedule a consultation with our florist today, or stop by our flower shop in Woodbridge.